When Evan Taylor came in the game our defense really ratcheted up in the first half. Illinois got the circus 3 and I said to my buddy ‘this is going to be an ET game’. Then he hit some shots and the announcers started talking about his great performance the first time we played them (I don’t do a lot of self scouting, so I had forgotten his great offensive game round vs Illinois). Disappointed he didnt play more minutes. Allen at the ‘point’ hasn’t been super successful. Glynn hurt us. ET at the 1 with Allen or Gill spacing out their zone in the second half was the answer I think. Allen off the ball has been successful. I’m sad ET didn’t get more minutes in the second half. May have been the difference. Hindsight is 20/20 but in my mind Watson is to the point to where if he isn’t going to produce (and even more to the point where he is hurting us) he needs to sit and see if we have other guys that will. Robys fourth foul was a BS call and was a huge and 1 situation. Huskers up 3 before play allowed Illinois to tie it at 61. Big call and not sure if he was touched by robys backside. Agreed. Awful call. Awful perimeter defense to allow him to get to Robys backside though. i hate to say it, but glynn is killing us. after tonight's game he is shooting 34% from the field and 27% from 3 for the season. I agree that last three of Glynn's was nothing but being selfish. He had Copeland set up on the wing for a much higher percentage shot. That and Palmer's 1 on 4 fast break were killers. That hero ball at the end was disappointing, and something we haven't really done in past pressure situations. Oh don't know if anybody said this but I think it was the lack of the BLACK JERSEYS. there's a silver lining here. this is a young team and even more inexperienced than they are young (because of all the transfer sit outs and bench warming before they got to NU). Sometimes you need to relearn tough lessons to help make them stick. Losing to the last place team when every game is for you postseason is just such a teaching moment. With a short turnaround, they're not going to have a lot of time to get into a funk about it, but they'll have just enough time to watch some film and talk about what they need to do to make sure they don't play this way against our next two opponents. No one's happy when a phat streak ends, but this wasn't a bad place to end ours. That Indy and PSU win are more important to us right now. So let's recover and get it done and go to NY and leave a handprint there. I remember back in 2014 when we were on a 5-game winning streak and lost on the road in Illinois and everybody thought the world was going to end. Things seemed to work out in the end. And Jordy didn't' touch anyone on the over the back call. But for the game, I thought we got a decent road whistle. I think we now know why they lost. In all my years of being a Nebraska Basketball fan there has been a list things we don't do well in a game. Nice thing is that this year that list is so much shorter than years past. That said, poor Free Throw Shooting cost us the game today. You just can't leave that many points out there in a close game. Yeah, time said post game that the guys weren't very focused before the game. So yeah I think this shows how it can come back to bite you in the was when you don't execute fundamentals and miss free throws. Hoping this is a wake up call and they get back to the good place we were at, and grab a win Tuesday. The bank will be open. LOL. Sorry nothing important to add except what a bummer of a game. It was a pretty ticky tack call and the contact was due to Black move Roby into the way. Illinois did a good job of containing JPJ today. He has been spectacular lately. He has been able to drive and score almost at will. Not today. Today he was getting hung up by double and triple teams on his way to the hoop. There should have been many team mates open when he was getting double or triple teamed when he was driving and he practically always took the shot anyway and it did not fall. Today may have been a good time to dish it to the open man as the drives weren’t working like they have been recently. They had his number and a plan that worked. He wasn’t able to take over. Very few if any assists to Roby who was open near the hoop more than a few times today. Roby had a great first half, 3 for 3 from three point land. Bad foul calls kept him off the court at some critical times down the stretch in the second half. Still with the double double again but it doesn’t mean much when they lose this huge game. And Glynn is struggling big time. Poor shot selection and it’s just not going in when he does shoot. He killed us tonight. How is it that illinois is so good against us? not been bad but he doesn’t inspire confidence as a fan when choosing between that and JPJ being aggressive. Allen with turnover woes from the point doesn’t either. So I guess it is pick your poison at some point. I’m sure it’s not that simple but you gotta have confidence in who you are passing to. Copeland and Roby don’t do a super job of gaining/maintaining position off ball in the post so just because their man helps off doesn’t mean they remain ‘open’. 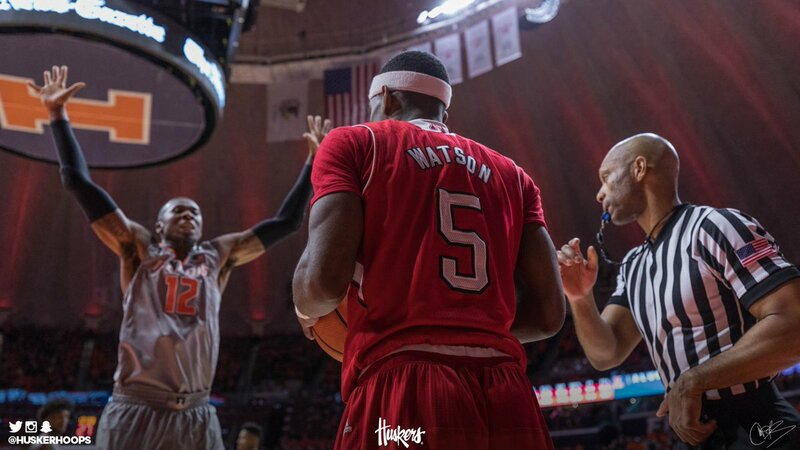 With this, the practice quote from Roby, and watching BTN the Journey tonight and watching Watson use the awesome spin and fake pass move and then intentionally throwing it off the backboard maybe there are some focus problems that need to be fixed/addressed. Of course basketball is supposed to be fun and young men will mess around but if you are trying to build up accountability, a toughness mindset, and ability to execute then Glynn isn’t making it happen...:for me anyways. Of course if he was shooting 55% from the field and doing this then I would say it’s awesome of his ability to keep the team loose. Unfortunately, I don’t think that is what is happening. The line between getting better while having fun is always a tough one to maintain. watch some film, get some sleep, get to class and it will be Tuesday before we know it. So we will know soon enough. I am happy to be kind of sad about a game loss this late in the season. Better than the last three years. I sensed big trouble when this happened as well. I thought we would still win at that point but we had a chance to really put it away. With more Allen you will get more turnovers and a lower 3pt FG percentage. FTR Gill goes 2-5 from 3pt range. One pet peeve i have with Palmer is he never passes the ball on fast breaks even when we have numbers. Ive seen countless 2 on 1, 3 on 2, and even 3 on 1s where hes leading the break and refuses to dish it to the man trailing. Could be remembering it wrong but it seems like it happens alot with him.